THE endurance of riders and their horses was put to the test in one of Tynedale?s fastest growing equestrian events. The Hexhamshire Trophy Ride has been growing in stature since it started six years ago, and this year was no different. The gruelling 53-mile endurance ride started at Cooks House Farm near Hexhamshire on July 31, and attracted a good entry of 14 horses from as far afield as Sussex and Argyll. Quickest off the mark was Danielle (Danni) Coulson, with Eyphorias Quest, from Northallerton, who was determined to win and make this race third time lucky. After the second vet gate, Danni was one second ahead of Rachael Atkinson riding Oakthwaite Zara, from Burnley, Lancashire. Finally, Danni won the Yorkshire-Lancashire war of the roses tussle after five hours of fast riding with four minutes to spare. The ride organisers, Janet Lennard, of Hexham, and Viv Knight, of Haltwhistle, cheered home Viv?s daughter Lee-Anne, who was riding Janet?s horse Kavanagh. It was the horse?s first attempt at this endurance ride distance, and he finished in an excellent eighth place. Fifty-nine horses and riders took part in competitive classes in the event, which was organised by the Northumberland and Tyneside branch of the Endurance Great Britain Society. Not only were they able to compete in one of nine different ability course routes, they were also given the opportunity to take part in a 12-mile pleasure ride along beautiful moorland tracks. The rain and drizzle of the previous three days gave way to dry, cool, ideal riding weather. The society thanked Ian and Jennifer Dodds, of Cooks House Farm, who provided ample stabling, camping and corralling, with a warm welcome. Bedmax of Northumberland provided shavings for beds and Northumbrian Water provided three water bowsers at Hexham, Catton and Allendale for keeping the horses cool on the trail. WCF of Hexham provided buckets for the hard working, and often forgotten, crews of the race riders. The trophy and prizes of glasses were sponsored and engraved by Border Trails Endurance of Bellingham. DUBAI - Shaikh Hamdan bin Mohammed bin Rashid Al Maktoum led his Arabian gelding Georgat to a thrilling finish to claim the 160-km European Open Endurance Championship at Campiegne in France on Friday. Shaikh Majid bin Mohammed bin Rashid Al Maktoum aboard Orcara took the third place honours. The great ride by Shaikh Hamdan enabled him to retain the title for the UAE for the third time in a row following their spectacular performance in Italy in 2001 when he finished along with his brother Shaikh Rashid in a 1-2 in the individual event and claimed the team's title as well. Meanwhile, General Shaikh Mohammed bin Rashid Al Maktoum, Crown Prince of Dubai and UAE Minsiter of Defence, claimed the title in Punchestown, Ireland in 2003. Almost 137 riders, representing 27 countries, lined up under the early rays of the sun at Campiegne for yesterday's ride. British rider Tricia Hurst, riding Vlace Khamul, showed the way and set a good pace of 18.54km/hour, while the winner was in the 28th position at the speed of 14.83 km/hour. Shakh Majid bin Mohammed bin Rashid Al Maktoum was 17th while advancing at the speed of15.4km/hour. The British representative continued to lead during the second phase but at a decreasing speed of 17.72km/hour as Shaikh Majid bin Mohammed Al Maktoum began to make ground and increased the pace to16.12km/hour to finish fourth. By the end of the third loop, the Australian rider Margaret Wade, riding China Poll, appeared from nowhere and hit the front at a steady pace of 15.97 km/hour. Shaikh Majid was fifth and Shaikh Hamdan was seventh at the time. Wade continued to lead by the end of the fourth and fifth stages. Shaikh Hamdan moved to second, and right on his heels was Shaikh Majid with French rider Geraldine Brault who advanced to fourth position for the first time. But Shaikh Hamdan, confident of the stamina of his mount, kept a strong pace to beat the Australian contender by a neck as the two riders crossed the finish line. ROYAL Endurance Team captain and Bahrain Royal Equestrian and Endurance Federation (Breef) president Shaikh Nasser bin Hamad Al Khalifa finished 14th among world class riders in the Open European Endurance Championship yesterday at the Campiegne Racecourse, near Paris. The Bahraini team finished fourth overall behind Belgium, the UAE and France who took the first three positions respectively. Riding Herrero Dela Motte, Shaikh Nasser was among 113 riders from 31 countries in this one-day event which was over 160 kms and divided into six stages. The first stage was over 32.8 kms, 21 kms for the second stage, 32.6 kms for the third, 20.6 kms for the fourth and 32 kms for the fifth and 21 kms for the sixth. Shaikh Nasser completed the race in nine hours, 59 minutes and 55 seconds with an average speed of 16.54 kms per hour. Shaikh Nasser was also the third Arab rider to finish the event after Shaikh Hamdan bin Mohammed Al Maktoum who won the race in 9:11:11 while Shaikh Majed bin Mohammed Al Maktoum was third. Kristel van den Abeele of Belgium claimed runners-up position. The Royal Team was led by Shaikh Nasser and included Breef first vice-president and Al Khaldiya Group captain Shaikh Khalid bin Hamad Al Khalifa on Snowy River Phantom, Al Fateh Stable's Shaikh Salman bin Saqer Al Khalifa on Alandell Thor and Yousef Taher of the Royal Endurance Team on Izaba Du Caussanel. The event was the first preparational phase for the Bahraini team in Europe for next year's World Championship to be held in Germany in August. The championship, which was part of the Horse Festival of Compiegne, will conclude today with the prize-giving ceremony at the Compiegne Equestrian Stadium. Vous trouverez ci-joint les dernières informations relatives au Festival Mondial d'Endurance qui se déroule à Compiègne du 24 au 28 août 2005. You will find enclosed the last news about the festival Mondial d'Endurance hold in Compiegne, 24-28 août. to announce the Australian teams for the Trans Tasman CEI*** to be held at Glen Innes on Saturday 8th October. This ?friendly ? International competition with our New Zealand friends , reciprocates the inaugural event held in New Zealand. The Kiwi?s worked very hard to care for the Australian team last year ,, and to provide us with very good horses. The Red Range track is considered by many to be Australia? s best 160k course. With a strong organizing team in place , we look forward to a great event. Woodstock endurance rider, Annette Bailey, won the prestigious NSW State Championship 160km (100 miles) endurance ride, held at Manilla, near Tamworth on 24th July. The ride was staged over four legs. The first two legs each covered 46kms through undulating to flat country north of Manilla. The 3rd leg crossed the Tamworth Highway and headed into undulating to steep country with the last leg travelling out towards Gunnedah and back into Manilla. AMMAN -- Princess Haya, half sister of Jordan's King Abdullah II and wife of Dubai Crown Prince Mohammed bin Rashid Al Maktoum, will run for the presidency of the International Equestrian Federation (FEI), she told AFP on Sunday. A keen athlete with a passion for riding, the 31-year-old princess represented Jordan at the Sydney 2000 Olympic Games - the first Arab woman to do so -- competing in show jumping. In a phone interview from London where she is currently, Princess Haya said she "will run in April for the presidency" of the FEI in the hope of promoting and revitalizing the sport across the globe "through a modern and efficient world-class body". "Ensuring that the Federation is fully transparent and works in accordance with sound and modern financial systems is of utmost importance to me, and imperative for the development and growth of the equestrian sport internationally," she said. Princess Haya has taken part in several international competitions, representing Jordan at Sydney 2000 and at the World Championships in Jerez 2002. She recently took part in the Dubai 2005 World Endurance Championship and is a member of the honorary committee of the Spanish Riding School. The princess has represented Jordan in the FEI General Assembly and was chairperson of the Middle East and Western Asian sub-group from 1992-1996. "I see equestrianism as a traditional sport with a modern future," the princess - who is daughter of the late King Hussein - said. Princess Haya is also a member of the International Board of Directors of Right to Play, an athlete-driven organization dedicated to bringing sports and recreation to children affected by war, poverty disease and illness. Bobbie Pomroy's family was waiting to congratulate her as she crossed the finish line at the Tevis Cup in California recently, with one notable exception ? her sister, Wanda Allen. Jon Ebelt IR Staff Photographer - Montana City's Bobbie Pomroy recently completed a one-day grueling horse race that covered 100 miles of tough California terrain including such challenges as 100-degree heat, crossing rivers and maneuvering past a swing bridge. Allen succumbed to lung cancer in 2001, leaving Pomroy to carry out her dream of riding her Arabian, Hopper, in the annual, daylong endurance race that travels the 100 miles between Lake Tahoe and Auburn. "I told her I'd take her horse to the Tevis Cup and she sort of laughed," Pomroy said, her eyes misting over with tears as she recalled the conversation with her dying sister, and the promise she made. Looking back, Pomroy admits that the solemn vow was somewhat laughable given that her riding experience at the time was next to none. 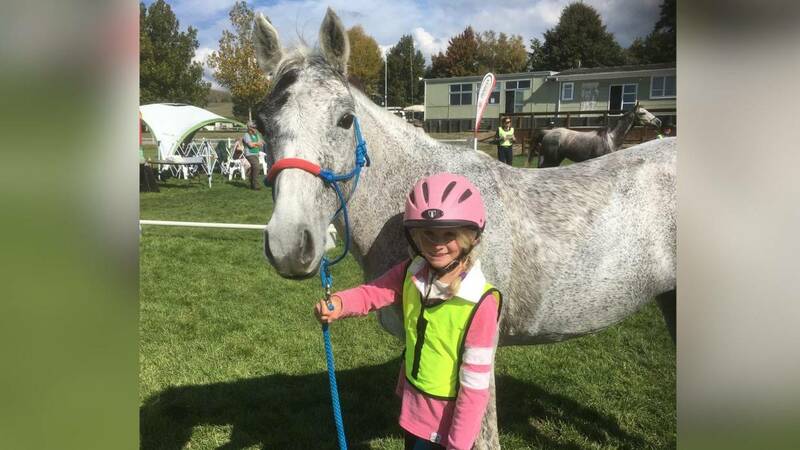 "She was the horse person," Pomroy said. "I was the runner." And Pomroy is no recreational jogger. In fact, she has competed in several ultra-marathons over the years, including one that covers the same ground as the Tevis Cup ? six times. Pomroy is credited with founding the Elkhorn Mountain Endurance Run with the aid of her husband, Jim. Pomroy is still a runner, but she put ultra-marathons on the backburner while she learned to ride the spirited horse that her sister brought home as a yearling and trained. It took Pomroy four years ? including countless hours of riding, and a lot of bumps and bruises ? to get herself and Hopper prepared and qualified for the strenuous ride. However, at 5:15 a.m. on race day, Pomroy wasn't too sure about what she had gotten herself into. "It was scary at the start," Pomroy said. She explained that the 199 horse/rider teams were separated into three groups ? she threw her lot in with the highly competitive teams so she could get ahead of the pack and leave the more unpredictable horses behind. However, the start was still a cramped, mad dash in the beginning, and Hopper had a tendency to kick should another horse get too close. Just the same, Pomroy said it wasn't long before she and Hopper established their place in the pack, allowing them to concentrate on the obstacles that stood between them and the finish line. One such obstacle was a swinging bridge that the pair had to cross. "She had never done anything like that before," said Pomroy, who explained that Hooper quickly accepted the swaying motion of the bridge as she trotted across, Pomroy leading the way. Next was the treacherous stretch of trail that the team had to cross at night, in the dark. Pomroy explained that riders weren't allowed to use headlamps because the harsh light might blind the animals, so many people used glow sticks to illuminate the path. Pomroy and Hopper chose to forge ahead without any such aid, with Hopper feeling her way along the route which bordered a steep ravine. "I kept telling her, ?Careful girl. Pay attention. You're such a good girl,'" Pomroy said. Then, Pomroy was nervous about crossing the American River, only a few miles from the finish line. She recalls watching the horse ahead of her ? at least two or three hands taller than 14-hand Hopper ? get shorter and shorter as it walked into the water. But Hopper forged ahead, swimming when she had to, Pomroy said. Above all the obstacles, Pomroy dreaded the oppressive heat most. In the valleys, temperatures soared to well above 100 degrees at times. According to Pomroy, her bargain with Hopper was that she would dismount and run the valley portions and ride out of the steep ravines in an effort to help Hopper beat the heat and fatigue that Pomroy knew would surely set in. Pomroy says her heart dropped when, on the way out of one of the canyons, Hopper let out a huge sigh and stopped moving. Pomroy pushed her on, but Hopper stopped again. At that point, Pomroy jumped off Hopper and ran alongside her until they reached the crest of the ravine. "After that, she was fine," said Pomroy, adding that she almost believes Hopper's break on the trail was really a way of gauging Pomroy's commitment to finishing the race, and to Hopper. She passed. Looking back, Pomroy thinks her sister might have had a good laugh at seeing her hoof it out of the canyon as she had in past ultra-marathons, but this time, with Hopper in tow. According to Pomroy, all the years of training, and the stress of the actual race, were well worth it when the finish line came into view. "It was absolutely wonderful," she said. "My family was there and I know my sister was there in spirit." Sitting in her desk at the Montana Affiliate of the Susan G. Komen Breast Cancer Foundation office last week ? her inner thigh and leg still raw from being chafed by the saddle ? Pomroy could honestly say she was content. Now, Pomroy said, she just has to choose her next challenge. AL Talia Stable will be sponsoring today's South African Endurance Horse Race following the success of last year's race. Sponsoring the 160-km race stresses the status that the stable and endurance racing in Bahrain have reached both domestically and internationally. The leader of Al Talia stable Shaikh Faisal bin Rashid Al Khalifa said that this step was taken because of the strong ties with the race's organising committee, which was built through the numerous and multifaceted contacts that the stable has had with them which includes buying and selling of horses and exchange of visits. Shaikh Faisal added that the main goal of the sponsorship is to gain media coverage for Bahrain and to put the Kingdom in general and endurance racing, in particular under the spotlight. He also hoped that the internationally accredited race being held under the supervision of the International Association for Endurance Racing will be a success for those goals to be accomplished.